The localization and segmentation of Intervertebral Discs (IVDs) with 3D Multi-modality MR Images are critically important for spine disease diagnosis and measurements. Manual annotation is a tedious and laborious procedure. There exist automatic IVD localization and segmentation methods on multi-modality IVD MR images, but an objective comparison of such methods is lacking. 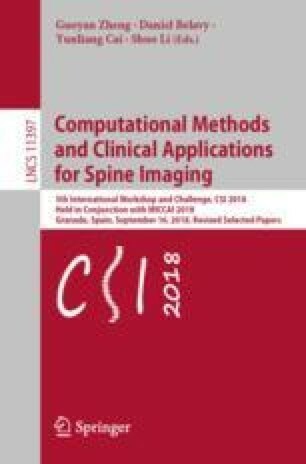 Thus we organized the following challenge: Automatic Intervertebral Disc Localization and Segmentation from 3D Multi-modality MR Images, held at the 2018 International Conference on Medical Image Computing and Computer Assisted Intervention (MICCAI 2018). Our challenge ensures an objective comparison by running 8 submitted methods with docker container. Experimental results show that overall the best localization method achieves a mean localization distance of 0.77 mm and the best segmentation method achieves a mean Dice of 90.64% and a mean average absolute distance of 0.60 mm, respectively. This challenge still keeps open for future submission and provides an online platform for methods comparison.